The Victoria Palace Theatre was closed for 20 months in the lead up to Hamilton’s December 2017 London opening. The centre aisle in the stalls (used as part of the action by the previous long-running tenant, Billy Elliot) is gone, leaving full width rows of very comfortably upholstered seats. The foyer is awash with gold trim and chandeliers, with an abundance of bars and bathrooms to easily satisfy the crowds to come. Work continues apace on the exterior, which is set to match the splendour within. The production’s new secure ticket system works very simply, with staff at the theatre’s entrance printing tickets for patrons after scanning their credit card on a small portable device. 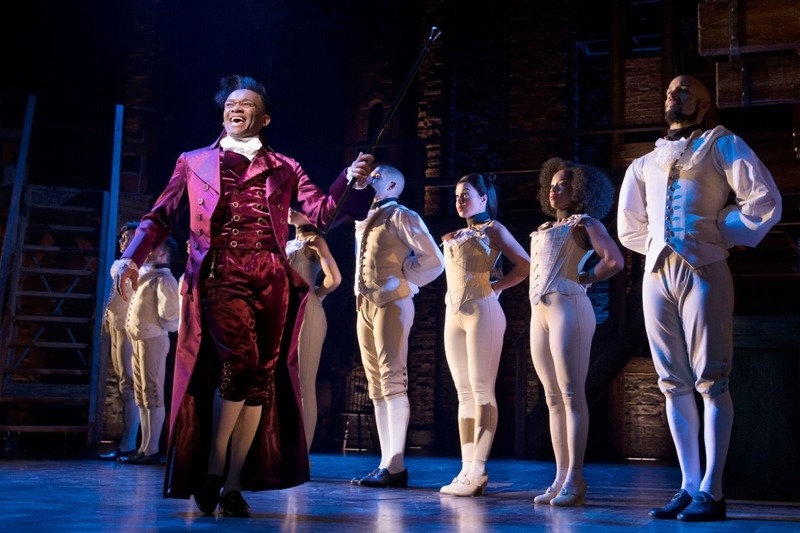 The concept and style of Hamilton are a perfect fit for London, a city steeped in history and a theatre industry completely accustomed to colour blind casting. The London cast is nothing short of exceptional. Each actor successfully makes their role their own, which is no small task given the adulation centred upon the original Broadway cast. A notable achievement here is the crisp diction, which significantly aids comprehension and processing of the rapid-fire lyrics. 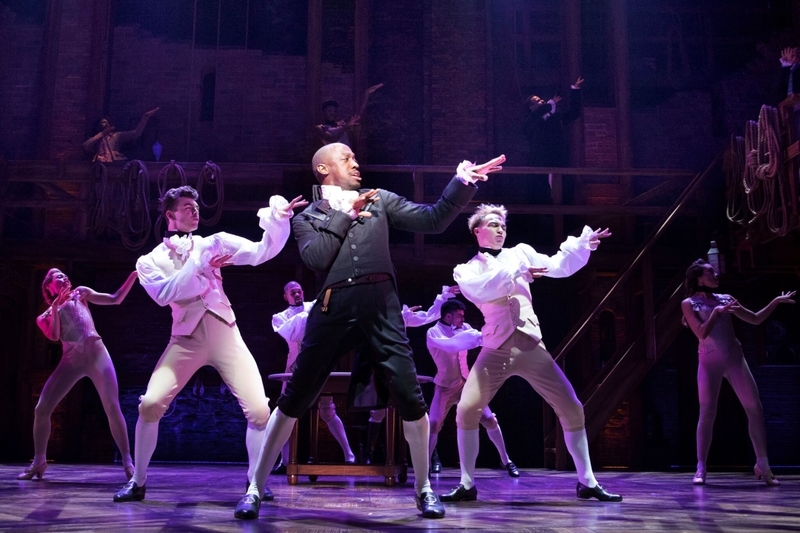 It has been almost three years since Hamilton premiered off-Broadway, and it is interesting to note that the composition and design are still blazingly new. Hollywood quickly cashes in on hit movies with strings of copycat films, but nothing on Broadway has yet matched the radical, bold style of Hamilton, with its through-sung, hip hop score, highly athletic, fully integrated choreography and cast of black/hispanic actors playing America’s all-white forefathers. A masterpiece of composition, Lin Manuel Miranda’s extraordinarily intricate score and lyrics reveal new layers and details upon each viewing of the show. Listening to the Broadway cast recording is entertaining in its own right, but delivers only a fraction of the storytelling, such is the highly visual work of director Thomas Kail and choreographer Andy Blankenbuehler. Kail and Balnkenbuehler’s work is intrinsically tied to the open plan design of David Korins, flexible costumes of Paul Tazewell and lighting of Howard Binkley in a way that can only be achieved when a production is the result of rock solid collaboration between artists. There may be a fixed set for the show, but each song/scene has its own distinct look an feel, propelling the story with great clarity. The London production has uncovered a terrific star in Jamael Westman. Apart from his performance abilities, Westman is also the tallest on stage, giving Alexander Hamilton a natural aura of leadership. Westman’s youth serves the initially 19 year-old Hamilton, but then his face changes subtly as Hamilton’s life progresses. Westman’s breakout performance will surely set him up for life on the stage, or whichever media he chooses. Giles Terera has a very minor lisp, which may not sound relevant, and, indeed, is barely noticeable, but it brings a very slight edge of extra humanity to Aaron Burr, who is set up from the opening number as the ostensible villain of the piece. Terera conveys Burr’s frustration at not experiencing Hamilton’s success, keeping the man driven and hungry but just ever so slightly sympathetic. Jason Pennycooke is particularly successful at claiming his roles for himself, putting a delightful personal stamp on both the dandy Lafayette and the assertive identity Jefferson (Pennycooke’s drop the mic moment is the best I have seen). Obioma Ugoala brings a strong presence to George Washington, clearly conveying the stature of a born leader. Tarinn Callender contrasts the brutish presence of Hercules Mulligan with the more pensive figure of James Madison. Fresh faced Cleve September endears himself to the audience as John Laurens, and is suitably adorable as Philip Hamilton, Alexander’s dear, ill-fated son. A particularly clever part of Miranda’s writing is the introduction of the Schuyler sisters. Following the introduction of all of act one’s male characters, the sisters inject a much-needed female voice, as well as providing a touch of glamour in the pale pastel silk gowns. Rachel John is beautifully cast as Angelica, neatly balancing the young woman’s plucky confidence with her latent vulnerability. At this performance, the role of Eliza was played by Marsha Songscome. Songscome has the sweetheart beauty of Eliza, and sings and acts the role with fresh appeal and lively presence. 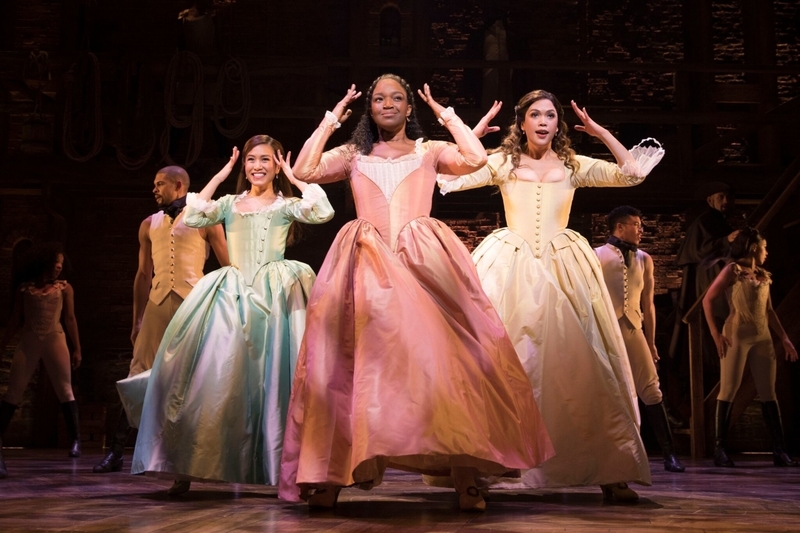 The role of Peggy is a cute but minor one; Christine Allado is featured again in act two as Maria, the woman with whom Hamilton has a regrettable affair. Allado maintains a sense of mystery as to Maria’s true intentions. I have been a keen fan of Michael Jibson ever since seeing him star as Joe Casey on my first visit to London back in early 2003. 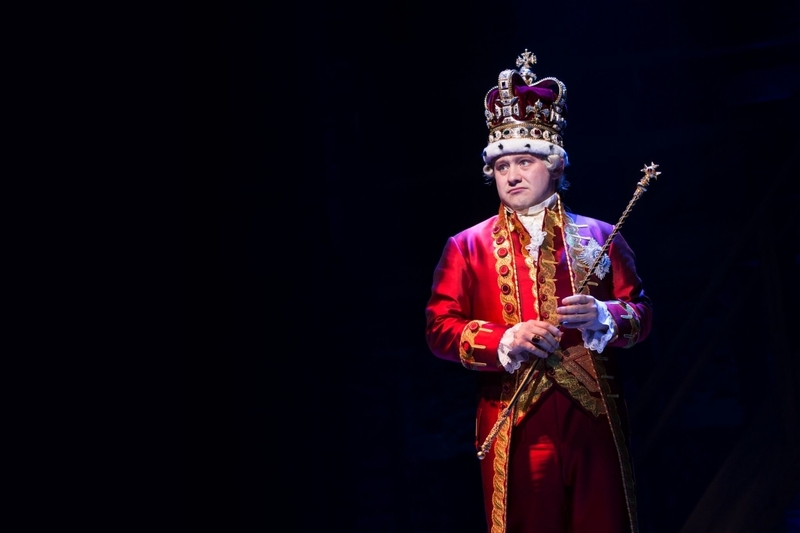 Jibson nails the delectable role of King George III, lapping up the adulation from the “home” crowd, who clearly appreciate the King’s position in relation to America’s quest for independence. The character is now a buffoon in context rather than just a buffoon (albeit a rather powerful and malicious buffoon). 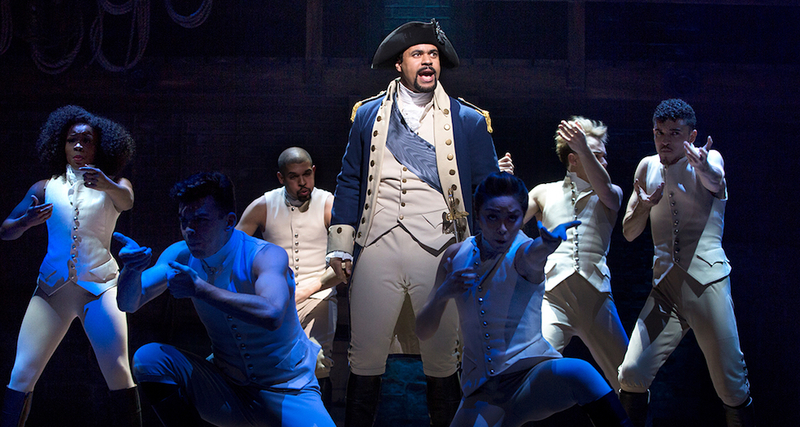 Hamilton is the very definition of must-see theatre. Secure a ticket by any means possible. 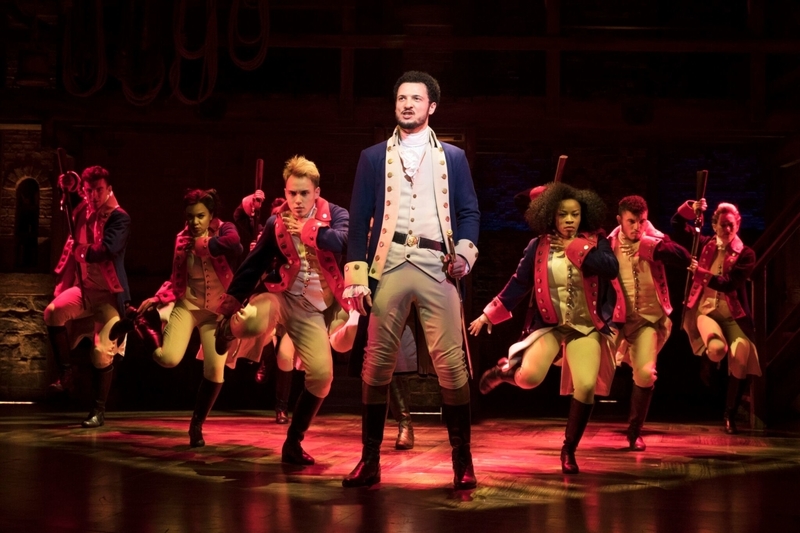 Hamilton was reviewed 2.30pm Thursday 11 January 2018 at Victoria Palace Theatre, London where it plays an open-ended run. Man in Chair also reviewed the original Broadway production of Hamilton. Really enjoying your informed London reviews, Simon. Any word on Hamilton for Australia?